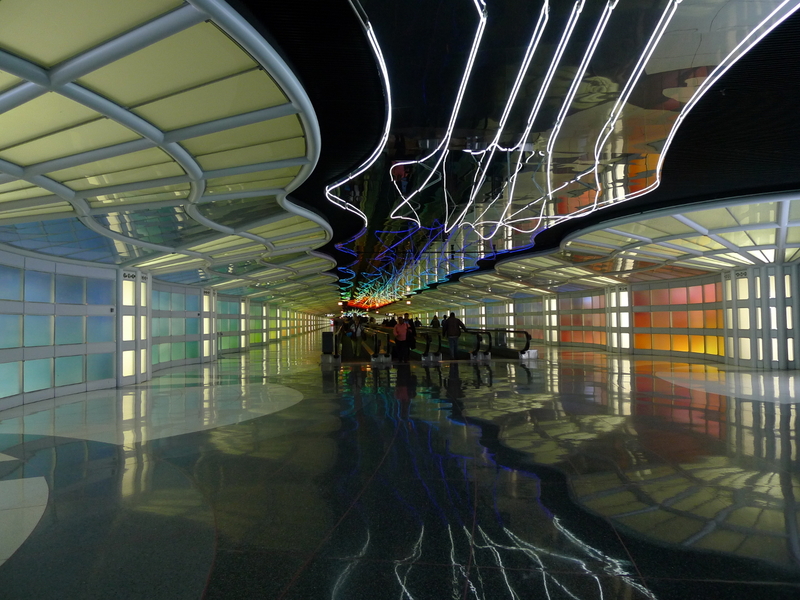 It looks to me like the people managing the LAX airport are starting to care more and more about its interior design, though there is still a long road to even start competing with Chicago O’Hare (as seen, for example, here), among others. 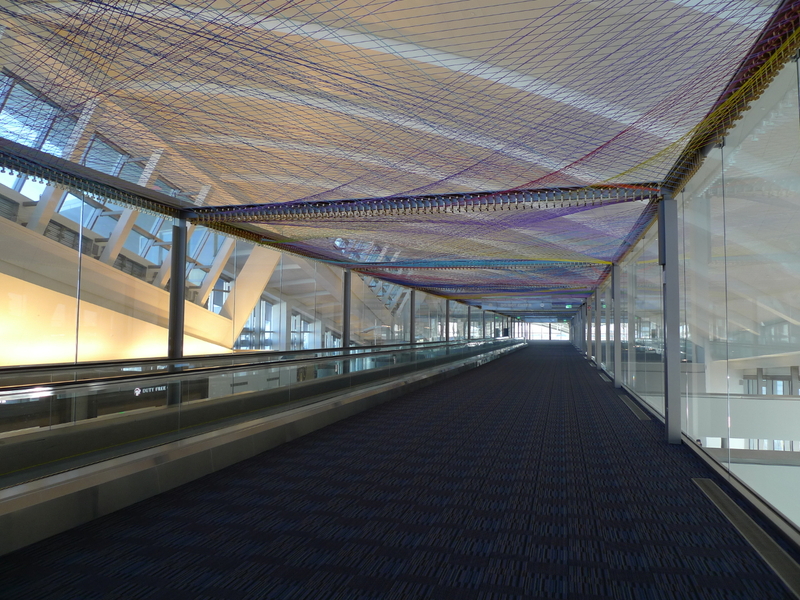 Nevertheless, I admire the concept behind this particular installation a lot: the multicolored threads make one immediately think of about 1700 flights that arrive and depart from LAX daily. To make the picture more compelling: it’s about one airplane either taking off or landing every 50 seconds, and that’s not taking into the account the significantly smaller air traffic between 12 and 6 am. Doesn’t it make you feel a newly found respect for the air traffic controllers? Yes, me too. And yet, there is a far less rational side of this installation as well. The delicate lines intricately woven in midair caught my attention even as I was dragging along after a 12-hour flight. Not caring neither about how tired I was nor about the line that was already forming in front of the U.S. Customs and Border Protection kiosks, I looked at the threads with a magical sense of awe that the public art still triggers in me – mostly because it’s unexpected and as such almost like a personal gift. For a moment I just stood there and let my thoughts wonder – which, as I later realized, suited the installation just right. Because if nothing else, isn’t it just a big dreamcatcher? This entry was posted in Bits & Pieces, LAX, Los Angeles, Public Art, Travel and tagged Bits & Pieces, LAX, Los Angeles, Public Art, Travel. Bookmark the permalink.